Comments: Herbaceous broadleaf native to Malaysia in Southeast Asia. Though not normally grown here for their fruit, banana trees are popular in Washington Township as an ornamental. 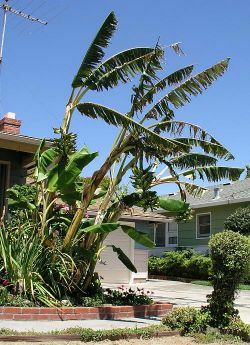 With proper care and cultivation however, bananas will fruit, and there is a commercial plantation along the coast near Ventura, California. This tree has been tentatively identified as M. acuminata.